If you’re anything like most Australians, you probably have too much stuff. It often happens that when household items get old, we get an upgrade and relocate the old item to somewhere else just in case we want it later. For example, your fridge might get a bit old and doesn’t quite do everything a 21st century fridge should be able to do. You upgrade and put the old one outside, keeping it as a backup in case you need more fridge space. It's likely never used. You may also have a place for old electronic equipment, furniture, clothes and linen, etc. It’s great to have the intention of reusing things instead of binning them, but sometimes a good clean up needs to take place. If you find this idea hard to swallow, you may be one of the 400,000 Australians suffering with a hoarding disorder! Over the years, the team at Same-Day Rubbish Removal have cleaned up many hoarders’ residences, it’s something that even hoarders never regret. If you have too much ‘stuff’ at your Leichhardt home or business, give us a call on 0402 737 046 and our friendly team will be there right away to help you clean up. The team at Same-Day Rubbish Removal have had over 10 years of experience removing trash from Sydney residences and businesses. In this time, we have worked out all the tricks of the trade so that we can give the best service for the best price. Our rubbish removal service works by us bringing our truck to your location, you directing us to the items that need to be taken away, and then us taking away your junk for responsible disposal and recycling. We cut out the costs of extra trips to the tip, or the delivery, pickup, and hire of a skip bin. We also make the job an easy, stress free time for you, you don’t have to lift a finger. In addition to Leichhardt, we service all of Sydney’s Inner West suburbs, including Newtown, Marrickville, and Homebush. Our friendly team look forward to helping you solve your junk problem, whether it be old white goods, furniture, or leftovers from a home renovation, our team are more than ready to clean it up for you. We also specialise in office/business rubbish removal, so if you’re a business owner and need a serious work clean up, the team at Same-Day Rubbish Removal are the people you need to call. Contact us today on 0402 737 046, you’re waste problems will be no more. Slightly west of Leichhardt, across the Hawthorne Canal, Haberfield is a popular Inner-West suburb which offers a lot to locals. If there are shops or services that locals don’t have access to locally, they have easy access to Parramatta Road, which can take them to Leichhardt or right into the city. As a Haberfield resident, you probably have better things to do than to worry about junk disposal, which is you’re probably reading this! Our team will take away all your rubbish removal problems with a simple call – we do everything for you, our services is fast, and you won’t find a better price. On the other side of Leichhardt, Annandale has a rich history. Major George Johnston who came to Australia on the first fleet owned 100 acres in the area and named the place after his birthplace of Annan in Scotland. Times have changed, and there are no Sydney residents with 100 acres of land to spare any more. 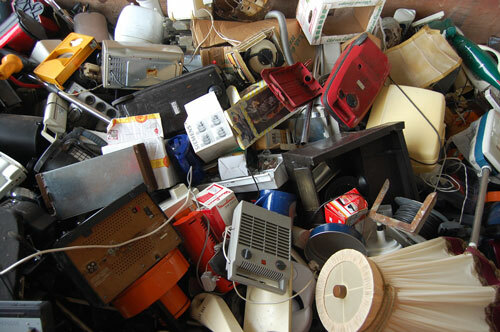 There’s no room to be leaving junk lying around your home or yard, so get rid of it today! Call our team on 0402 737 046 if you want the fastest, cheapest and easiest service in the area. There’s no reason to keep your junk, so get your Annandale home cleaned up today. Located South-East of Annandale, and across the Great Western Highway, Camperdown is the home of the Royal Prince Alfred Hospital and the University of Sydney. Naturally, there’s a high population around this area, with many residents needing junk removal services. Our team keep quite busy with Inner-West jobs, so we’ve always got at least one truck ready to go. The types of items we collect here are fairly similar to what we collect in most of Sydney, which includes, white goods, furniture and e-waste. It doesn’t matter what you have though, if you don’t want it cluttering up your home or business, we can take it away from your Camperdown property. We service the University of Sydney too, so if you live or work here, don’t hesitate to call.